Dried Fruit: Is It Really Nature’s Candy? Have you ever tried dried cherries? Wow, are they good. Truth be told, I couldn’t stop #eating them. I kept telling myself that it was just to taste them for research. I tried not to be fooled by the health halo. Thinking: It’s a fruit, so it’s healthy. But I wasn’t mentally prepared, and so I overindulged. I wanted to find out if #dried fruit is really healthy — and here’s what I discovered. Before the invention of chemical additives to keep foods fresh, drying was one method of preserving #food. Organisms that create food spoilage need water to survive. Basically, the drying process removes most of the moisture from the food, thus preserving it. The three most common methods of drying are solar, oven and an electric dehydrator. Even though many supermarkets put dried fruit in the candy section, it can be an excellent source of fiber, nutrients, antioxidants and complex carbohydrates. And some varieties have other special benefits. For instance, dried cherries have recently been shown to help fight jet lag. In terms of weight control, there is no comparison. Fresh fruit is the better choice. You get much more for fewer #calories. For instance, 1 cup of dried blueberries (sweetened) (296 blueberries) has 600 calories, whereas 1 cup of fresh blueberries has only 84 calories. So, before you start digging into a bag of dried apricots or cherries, consider how many you’re going to eat. A low-calorie food is only a good deal if it fills you up at the end of a serving. The problem with dried fruit is that when the water is removed, it becomes less filling without losing any calories. 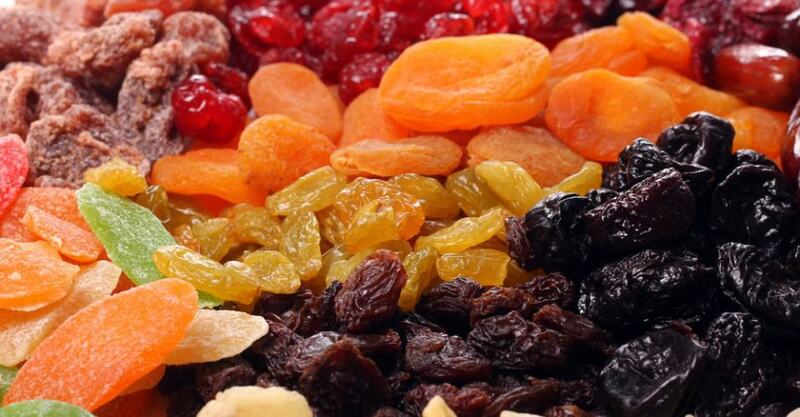 Dried fruit just becomes sweeter, more concentrated and easier to over-consume. Plus, many producers of dried fruit add sugar, thus increasing their already dense calorie levels. In fact, ounce-for-ounce, all types of dried fruit are much higher in calories than their fresh equivalents, because of the water that’s lost and the concentration of sugar that is created during the drying process. Take a look at raisins compared with grapes: They have about 73 percent less water than grapes. In terms of the antioxidants in dried fruit, research published in the Journal of the American College of #Nutrition reported that dried figs and plums have the best nutrient scores. Additionally, the researchers concluded, “Dried fruits have a greater nutrient density, greater fiber content, increased shelf life, and significantly greater phenol antioxidant content compared to fresh fruits. The quality of the antioxidants in the processed dried fruit is the same as in the corresponding fresh fruit.” However, vitamin C that is present in many fresh fruits is destroyed by heat in the drying process. Bottom line: Dried fruit is high in fiber and carbohydrates and low in fat. It has significant antioxidant value; however, because it’s dried, its nutrients are very concentrated, and so are its calories. According to the Centers for Disease Control and Prevention, the recommended serving size for dried fruit is half that of fresh. I would also recommend portioning your dried fruit out into small, manageable serving sizes by splitting a regular bag into four to six servings. Even 100 percent juice has real calories. In most cases it has the same number of calories per serving as soda and sweetened iced tea. Juice is less filling than dried fruit, and it contains less of the fiber fruit is famous for (whose health benefits include reducing the risk of some cancers, lowering cholesterol and keeping you “regular”). For instance, 1 cup of pineapple juice is 120 calories and has little or no fiber, whereas 10 pieces of dried pineapple chunks are about 140 calories, and the dried pineapple rings are about 65 to 70 calories each, with about 1 gram of fiber. Compare that with the fruit itself, which is about 70 calories per cup with about 2 grams of fiber. Bottom line: Most varieties of dried fruit have most of the fiber and nutrients that are in fresh fruit. Whereas the juice may have many of the antioxidants, but it is missing the fiber, and it isn’t as filling. Dried fruit (without added sugar) might be the better bet compared with juice. A potato chip is a vegetable, right? The problem is that potato chips are fried and have about 150 calories per ounce compared with about 100 calories per ounce for, say, banana chips. If you choose baked chips, yes, the calorie count is lower (130 calories per ounce), but the dried fruit is still better on several levels. It’s lower in calories, can be more filling (because of the fiber) and has many valuable health perks (such as antioxidants and fiber) lacking in potato chips. Freeze-dried foods are not just for astronauts and hikers. Freeze-drying food removes the water almost entirely, which lowers the weight, and while you don’t get the same feelings of fullness you do from dried fruit (which is about 25 percent water vs. 6 percent for freeze-dried), it can be a satisfying snack that still has health perks. The antioxidants found in the fresh fruit are maintained after freeze-drying. One company, Sensible Foods (www.sensiblefoods.com), has a freeze-drying process that removes the water while maintaining the product’s cell structure and nutritional value and intensifying its natural flavor. Freeze-dried food also tends to come in lower-weight packages than dried – which means fewer calories if you eat the whole package. A bag of dried fruit can be about 450-500 calories, whereas each full bag of freeze-dried fruit (equivalent to 1/2 cup of fresh fruit) makes for a satisfying snack at only 80 calories with 1 gram of fiber. One bag of Crispy Green Apples (10 grams per bag) from Crispygreen.com is only 35 calories. So freeze-dried fruit can be a healthy alternative to chips and other snack foods. Other benefits of freeze-dried fruit are that it has a long shelf life and can be stored and/or easily packed for on-the-go eating. And finally, freeze-dried fruit, unlike regular dried, is often made without any added sugar.